Joseph Carl Robnett Licklider (known as Lick) was born on 11 March, 1915, in St. Louis, Missouri, USA. He was the only child of Joseph Parron Licklider (b. 1873), a Baptist minister and teacher, and Margaret Robnett Licklider (b. 1881), a homemaker. The little Robnett, as he was known as a boy, was a happy, energetic boy with a lively sense of fun, and early on displayed an insatiable curiosity and a love of all things technological, especially cars. At 15, he bought an old junker and took it apart again and again, trying to figure out its inner workings. For years thereafter, he refused to pay more than $50 for a car; whatever shape it was in, he could fix it up and make it go. After graduating at public school system of University City, Mo., in June, 1932, he enrolled at Washington University in St. Louis, where in 1937 he obtained a triple degree in physics, math and psychology, and an MA degree in psychology in 1938. In 1938 he entered the University of Rochester in New York, from which he received a Ph.D. in psychology in 1942. For his doctoral dissertation he made the first maps of neural activity on the auditory cortex, pinpointing the regions crucial to our ability to hear musical pitch. Lick’s professional career began in 1942, when he joined Harvard's Psycho-Acoustics Laboratory. It was wartime and the Army Air Force was funding a team of psychologists at that lab to attack the problem of noise. USA had just entered World War II, and aircraft crews were finding it difficult to function amid the overwhelming din of the engines. Lick devised a method for artfully distorting radio transmissions to emphasize consonants over vowels and thus make words stand out against a background of radio static and mechanized cacophony. Lick’s wartime research was presented after the end of the war in a series of papers, many of them co-authored with various colleagues. His discovery led to significant equipment improvements, for which he was granted a patent, as well as the Biennial Award for Outstanding Contributions to Acoustics of the Acoustical Society of America in 1950. In 1945 year he received a non tenure appointment as a lecturer at Harvard University, where he remained until 1950. Lick married on 20 January 1945 to Alberta Louise Carpenter (b. 1919). They had two children: Tracy Robnett, born 1947 and Linda Louise, born 1949, in Arlington, Mass. 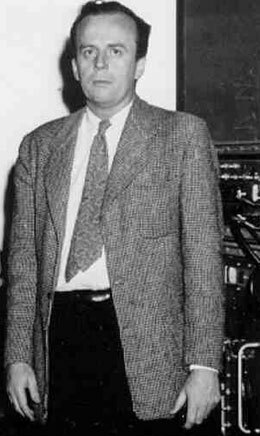 In 1950 Lick was appointed as an associate professor at the MIT (Massachusetts Institute of Technology) and remained there for seven years as director of the Acoustics Laboratory. In his second year at MIT, he was retained by the U.S. Air Force laboratories as a consultant in the fields of pitch perception and the intelligibility of speech. During the administration of President Dwight Eisenhower, Licklider was an adviser to the Research and Development Board (1953-1954), the Office of the Secretary of Defense (1954-1955), the committee on biotechnology and human research at the National Aeronautics and Space Administration, and the Commission on Science and Technology. In recognition of his contributions to psychoacoustics and his distinguished government service, Licklider was elected president of the Acoustical Society of America in 1958. Developing in 1950s his theories of perception Lick used the analog equipment. He found out, however, that analog computers were not flexible enough to help him in his theory-building effort. This disappointment with analog computers marks the beginning of his love affair with digital computers as modeling tools. Thus he switched to the field of computers and made very important contributions in this field. Lick seems to have been one of those rare beings who genuinely didn't care who got the credit, so long as the goal was accomplished. He was remembered as "extremely intelligent, intensely creative, and hopelessly generous" with his ideas. "Lick was probably the most gifted intuitive genius I have ever known. Whenever I would finally come to Lick with the proof of some mathematical relation, I'd discover that he already knew it. He hadn't worked it out in detail, he just knew it. He could somehow envision the way information flowed, and see relations that people who just manipulated the mathematical symbols could not see. It was so astounding that he became a figure of mystery to all the rest of us: How the hell does Lick do it? How does he see these things?... Talking with Lick about a problem, amplified my own intelligence about thirty IQpoints." Lick was also a gifted and prolific writer, as his bibliography lists more than 100 formal publications, in addition to laboratory reports. In addition to the National Academy of Sciences, he was a member of the American Academy of Arts and Sciences, the New York Academy of Sciences, and the Washington Academy of Sciences, and a fellow or member of a large number of other professional societies. He was also the recipient of the 1965 Franklin V. Taylor Award of the Society of Engineering Psychologists, of the 1968 Outstanding Alumni Award of Washington University, and of the 1990 Commonwealth Award for Science and Invention. By the time microcomputers hit big in the early 1980s, Lick was pushing 70. Just as his ideas of personal computing and networking were coming to fruition, he was losing the vigor to contribute significantly to the cause. His hands had a noticeable tremor—a condition that would eventually be diagnosed as Parkinson's disease. His allergies had crossed the line into asthma, and he never went anywhere without an inhaler. In the end, it was the asthma that finally caught up with him: An attack left his brain without oxygen too long, and Lick died without regaining consciousness on 26th of June, 1990, at Symmes Hospital in Arlington, Massachusetts.